Hi everyone! I'm so happy you're visiting me today. This is the reveal day for A Time to Stitch 5! 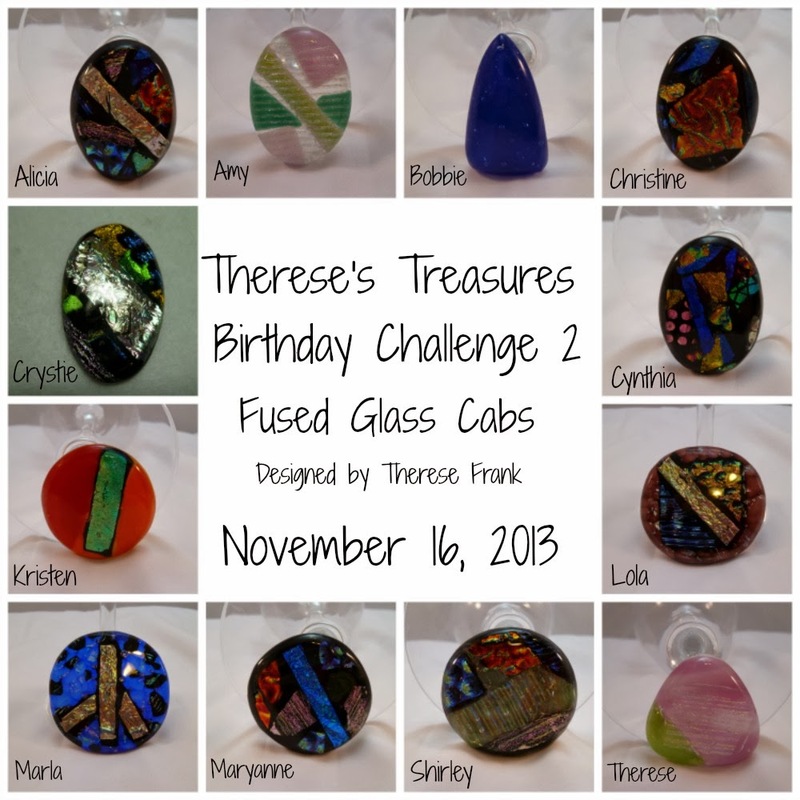 For those of you who aren't familiar with this challenge it's the creation of Christine of One Kiss Creations and Therese of Therese's Treasures. 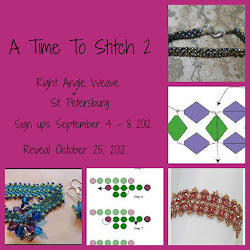 The idea this time is to use one stitch to make three different bracelets or necklaces. The stitch I chose was Spiral Rope! I love spiral rope. I love stitching it and I love the look of it. With this challenge we were supposed to use a stitch with different shaped beads. Well, I do a lot of that with spiral rope so I was even happier! There are so many new shaped beads out there that it's not a problem to find something different. I used drops, lentils (the original with one hole), and two hole Rulas. I've used drops before and the Rula pattern is an original my friend, and bead shop owner, Kathy designed. 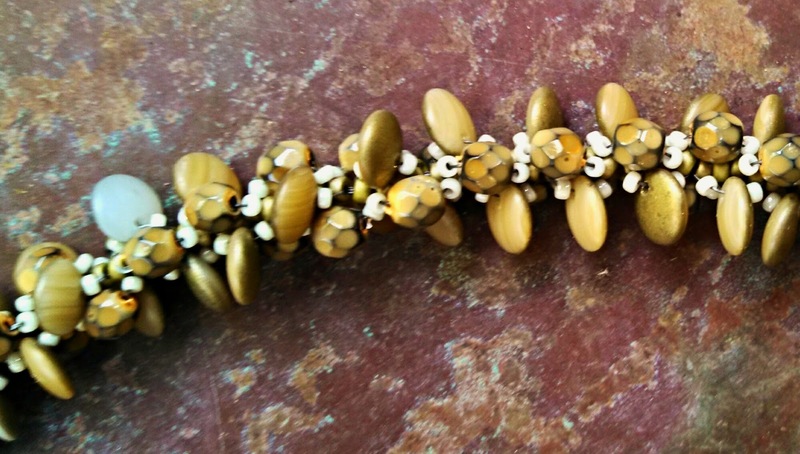 I have never used lentils in a spiral necklace even though the original lentil beads are some of my favorites. So, here are pictures of the three necklaces I came up with. 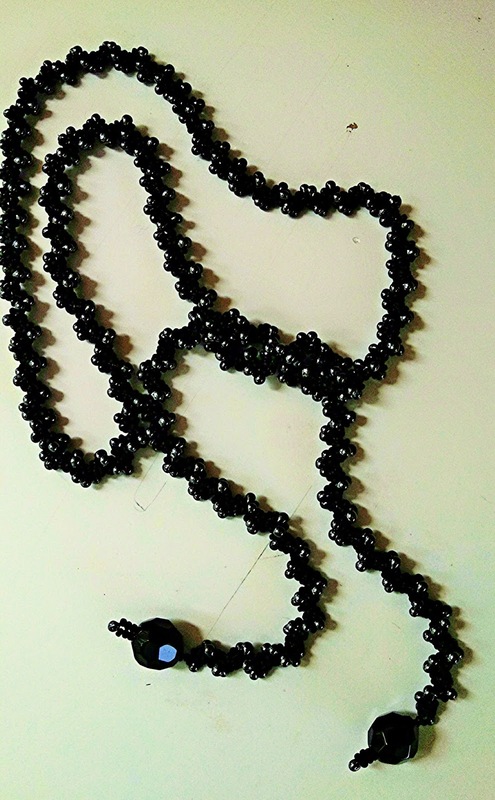 I wanted a plain black lariat so I used black 11s for the core beads and black 15s and hematite drops for the spiral. I ended it with black fire polished rounds and 15s and a drop. I really like the simplicity of this lariat. It's easy to wear and it goes with so many things. The new Rula beads are so fun! They are long round beads with a hole at the top and bottom. My friend Kathy was looking for a different way to use them and came up with this necklace. You make your spiral as usual using 8s for the core, 11s and a Rula for the spiral. That leaves you with the extra hole free. You come back starting from the end of the spiral and connect the second hole with 15s. It makes for a very lovely and different looking spiral. It looks like a frill. I loved the color of these Rulas and I used a color mix of 11s to change the color dynamic a little. 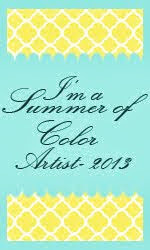 It's a great summer necklace! Lastly, I used the lentils along with some fire polished beads that went so well with the lentils that I couldn't resist using them together. These lentil beads had an old gold metallic finish on one side and the other side ranged from whitish, to tan to matte gold. You can see some of the changes in color in the picture. 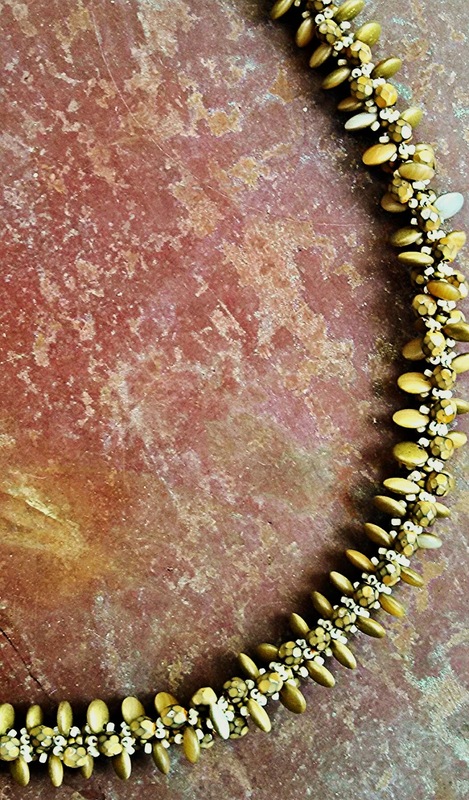 The fire polished beads were old gold and with a black vein on the edges of the facets. I used a matte old gold 11 and a 15 in a wonderful color called Limestone. It's not a white but not a tan or grey. Just a lovely off white and I know I'll use them again. I was pleased with how this turned out. The spiral is more subtle than some but I love the way the lentils fall and dance around the core. Here's a not very good picture of more of the necklace. There you have my three entries into this always fun challenge. I want to thank Therese and Christine for hosting.Take a minute to visit the other participants. Here is a list of names. Thank you for visiting me today. I really appreciate your visits and I hope you have a wonderful week! Cool! I like the spiral ropes too. 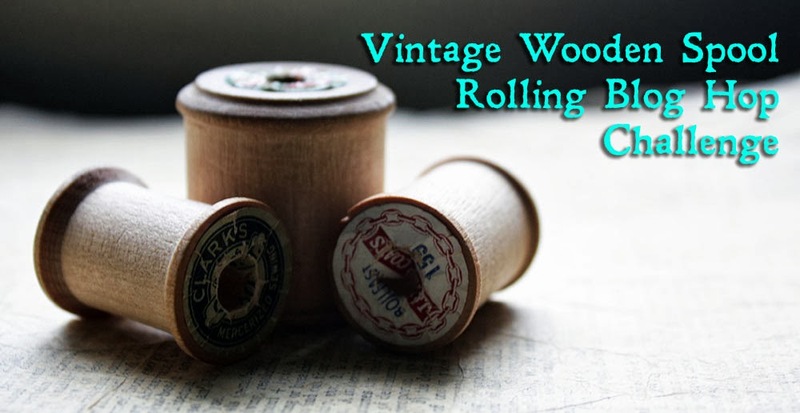 I had seen these projects all over the house and wondered what you were doing! They all turned out so well! I really love the antique look of the one with the lentils. Awesome pieces! Each one is so unique! Hard to decide which I like best. Great job! We didn't have to do spiral rope - the choice of stitch was completely open, you could have done herringbone or peyote or whatever. I DID chose to do spiral rope, but in a different way to you. You have some great outcomes here, I love the look of the rope with the lentils. I don't' really understand what the Rula is though. Ah, you've inspired me to use rullas in a spiral -- what a great effect it makes! And your other pieces are elegant. I'm sure you'll enjoy wearing all of them. Thank you I will take all 3! Love your colors...that aqua is to die for....I had to get up close to see all the details. Wonderful!! What fun designs! After reading your post, lentils are definitely on my bead-buying list. Those hematite edge beads add just the right sparkle to your black lariat and who can resist the summer colors of your second rope? But it's your final lariat that has my eyes popping. Love this one. Every inch of it!!! I think the lentil one is my favorite, I just love how those fire polish beads go so well with the lentils. Do you remember where you purchased the fp? Oh Wow Maryanne your Spiral Ropes blow me away. Just getting one rope long enough for a necklace is a challenge for me, but you did three same but very different ropes. I love all three so I am not going to pick a favorite, but I am going to try the rope with the Rulas. Thank you so much for participating again in ATTS challenge it is always a pleasure to see what you create. I hope that you will join us for ATTS 6 we are going to kick it up a notch. I love spiral stitch and I love the different looks of your ropes, the 2-hole beads look like fun to use, I'll have to try this. Spiral rope was a popular stitch (I used it too lol). I love the way all 3 of your necklaces came out. I guess the black lariat is my favorite because I just have a thing for lariats. Great job! 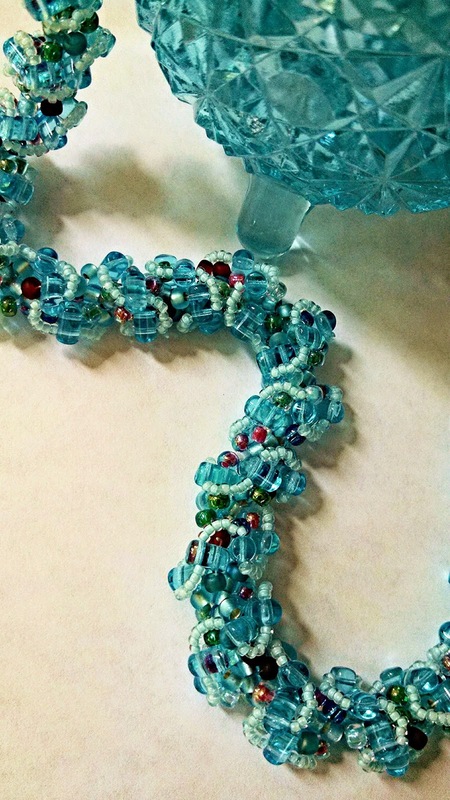 Wow, what wonderful beading - I adore the turquoise one and I love the little glass dish with it - just gorgeous. Thanks so much for visiting and for your kind wishes - I'm just off to see some more of your work! They are all nice but I am partial to the black one. Wonderful necklaces. Love the rullas!,, and the lentils. Amazed that the same stitch can be so different. All these designs are great and wow - your bead selection really really really highlighted how the beads affect the design! Each one is so pretty!! Wonderful interpretations of spiral rope! My favorite is the Aqua, but they are all so different and so beautiful!